According to Pacific Union data, 53 percent of Bay Area homes sold over the past 18 months were staged before sale. A survey from the National Association of Realtors found that about two-thirds of U.S. real estate professionals think that staging a home helps it sell quicker. A survey of Pacific Union real estate professionals showed that homes sold almost twice as fast when staged and received on average more than one additional offer. Staged Bay Area homes sold for almost 45 percent more than those that were not staged. Sellers hoping for a speedy sale should seriously consider staging their homes, a process that most real estate professionals believe helps a buyer better visualize the property as their own. That’s true here in the Bay Area, where staged homes not only sell nearly twice as fast but receive more offers and command higher prices. Data collected by Pacific Union confirms survey results from the National Association of Realtors’ 2017 Profile of Home Staging survey, in which more than 60 percent of real estate professionals said that staging a home reduces its time on the market. 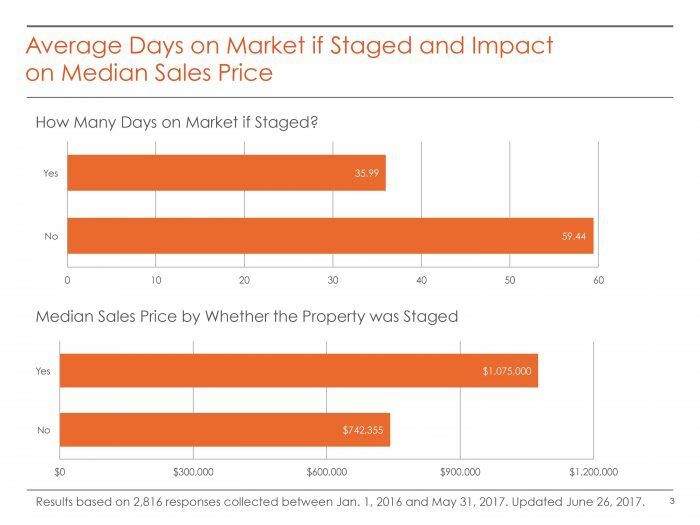 Pacific Union Chief Economist Selma Hepp analyzed more than 3,200 of our firm’s transactions, which showed that staged homes sold in an average of 36 days, while those that were not staged sold in an average of 59 days. 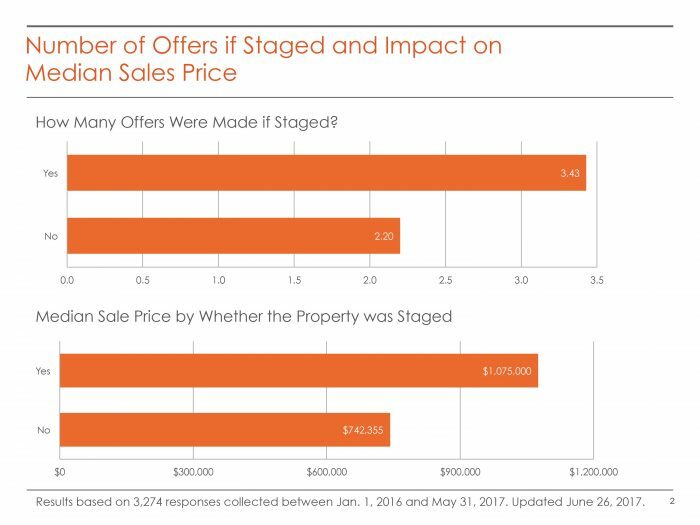 Real estate professionals surveyed by NAR were almost evenly split on whether a staged home commands a higher sales price. 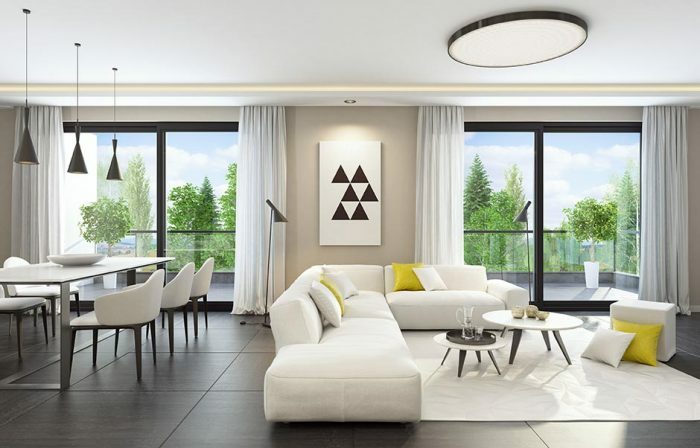 Forty-nine percent of those surveyed believe that staging increases a home’s value from 1 percent to 20 percent, with most estimating that a staged home sells for 1 percent to 5 percent more. Twenty-five percent of respondents said that staging has no impact on a home’s dollar value, while 26 percent were unsure of its effect. 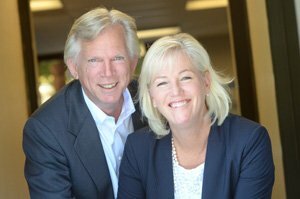 Hepp’s research found that the median sales price of staged homes sold by Pacific Union in the Bay Area was $1,075,000, while the median price for nonstaged homes was $742,355. However, it is not clear whether staging itself led to higher prices, since it is possible that those selling higher-priced homes were willing to spend the additional money. Real estate professionals surveyed by NAR were nearly evenly divided on whether to stage a home, with 38 percent opting to stage all properties and 37 percent recommending home improvements instead. Hepp’s research showed that 53 percent of Pacific Union homes were staged, the majority by a professional company. NAR found that more than three-quarters of real estate professionals who represented buyers think that staging a home makes it easier for their clients to picture themselves living there. Forty percent of those surveyed said that buyers would be more likely to walk through a staged home that they found online, and 27 percent felt that it would make their clients more forgiving of a property’s negative aspects. 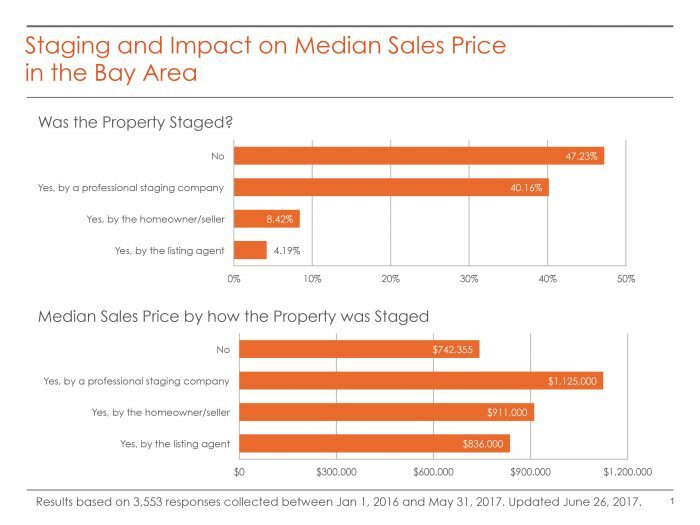 In the Bay Area, staging helps garner additional offers, with homes receiving an average of 3.4 offers when staged compared with 2.2 offers when not staged. The living room is the most popular area of the house to stage, recommended by 83 percent of real estate professionals that NAR polled. The kitchen and the master bedroom are the next two most important rooms to stage, garnering a respective 76 percent and 69 percent of the vote.